We strongly recommend using the size chart found here to find your correct sizing, and not just ordering your normal size. Be aware that formal dress sizing is different than other types of clothing and you will usually need 1-2 sizes larger than your regular clothing size. It is also normal to fall into different sizes across the size chart. If you need some guidance choosing the proper size Contact Us, we are happy to help! Once you have submitted the form at the bottom of the page you will be prompted to enter your payment amount. This information has hopefully been provided to by the bride and groom, but if not Contact Us and we will be happy to help you! Option 1: Visit a bridal boutique in your area. Some boutiques will provide measurements when you are buying from another bridal shop free of charge. If by chance the boutique you visit does charge a fitting fee it is the customers responsibility to pay these charges. If option 1 is not possible, you will find detailed instructions on how to measure yourself here. We recommend you have a friend help you do this, and use a sewing tape measure that can be purchased at any Wal-mart or sewing/craft store. This is only required if the name on the card differs from the customer name. We'll send a detailed invoice to this address. 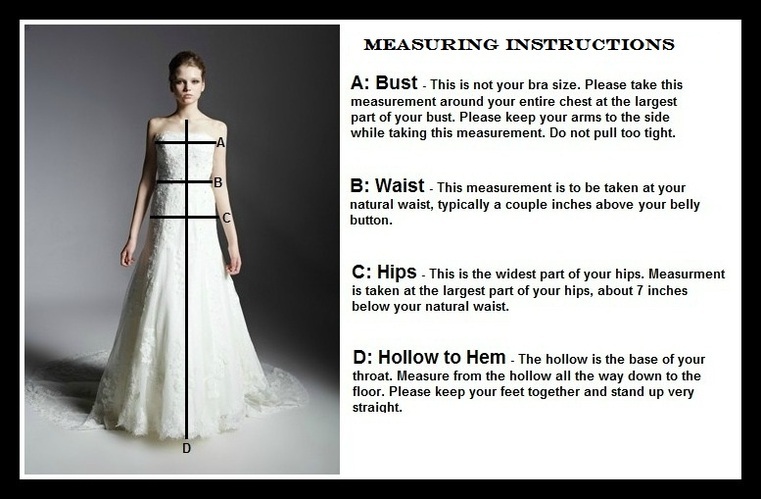 This measurement tells us if your dress will need extra length added. The standard hollow to hem length is approx. 61", adding extra length will add approx. 5" to the overall dress length. Next you will be directed to the payment screen, where you will be prompted to enter your payment amount. Since the payment amount can vary with each order, this information will have been provided to you by the event contact. We will follow up via text or phone call if we have any questions about your order or payment.